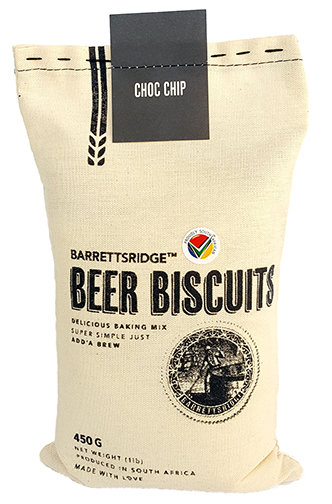 Because everyone loves to indulge and diets always start “next week”, we’ve introduced Barrett’s Ridge Choc Chip Beer Biscuits – Crispy on the outside and chewy on the inside! What’s not to love? Top these indulgent little biscuits with a drizzle of salted caramel for an even more guilty pleasure. Pour entire contents of Barrett’s Ridge Choc Chip Biscuit into a bowl. This biscuit mix makes for a great ice cream sandwich. Simply bake the biscuits as per instructions and use your favourite ice cream as a filling. Then dip in nuts or sprinkles or melted chocolate… the possibilities are limitless. What’s your serving suggestion? Share it with us on the Barrett’s Ridge [Facebook] page! For this decadent mix, The Barrett’s Ridge bread bakers recommend pairing with an equally decadent Lambics beer. These Belgium beers come in a variety of flavours and bring a touch of fun and fruitiness to these chewy little morsels.